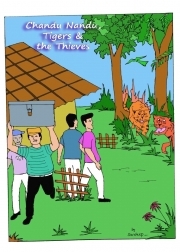 Description of "Chandu Nandu, Tigers and the Thieves"
A story of two brothers living in a village and their encounter with some tigers while they had to travel through a dense forest. Meanwhile some thieves are eyeing their house. Somehow they managed to get rid of both the thieves and the tigers. Sandeep Kumar, B.Tech graduate from IIT Roorkee. A graphic novelist, currently working in a private firm. Reviews of "Chandu Nandu, Tigers and the Thieves"